Decorating can be confusing. There are so many products on the market. New colors, furnishing, accessories, finishes, textures and styles come out every year. And what to do with that Radiant Orchid pantone color? How do you keep your home fresh without giving into every trend that comes along and staying within some reasonable budget? Tufted headboard from Ballard Designs. Photo: Ballard Designs. The advice to my southwest Florida clients making major purchases: ask yourself, will you love it in five years? Keep major items in your home timeless. Take a chance with paint color and accessories and have some fun. The trends for 2014 are, well, spectacular. Simple and low maintenance are the keywords for homeowners. And while there is no point in going crazy in making dramatic changes just for the sake of a trend, you can tone some of these down and pick and choose what works for your lifestyle. Here are a few trends along with some of my tips for the year. Have fun! At one time that large dining room or formal living room made sense. But lifestyle changes can make them a wasted space. That's why many homeowners are converting these spaces into entertainment rooms, libraries and more to make the space more functional. BEFORE: Owners of this West Bay home wanted to transform this formal living room to a more useful space. AFTER: Space is changed into an entertainment room that is used daily by family and friends. Indigo! From the bedroom to the living room and for every imaginable accessory, this peaceful, comforting color will bring to mind the deep blue of the sea. Tip: It's great for pops of color in rooms with a neutral/white palette and works with a nautical scheme. For paint: black walls are popular, white walls are still the trend. Accent walls are not so popular as painting the entire room is the trend. Grey is still the new beige and is everywhere in many shades. Farrow & Ball paints are hot, pricey and worth a look. The high levels of pigment, rich resin binders, and the high refractory nature the key ingredients give the paints their signature depth of color. There are 132 colors and they are available to the trade through Kravet at the Miromar Design Center. Grass cloth has made a return with rich textures and colors. It can be painted when you are tired of it so it has a longer lifespan. Everywhere. Rather than doing an entire wall (very 80's and making a comeback), I suggest a large framed mirror or a collection. Antiqued mirror from Restoration Hardware with a vintage look is handfitted from multiple pieces of beveled, mitered and joined glass. Photo: Restoration Hardware. There have never been so many great choices in table lamps. Give your room an instant makeover with a fresh color with two new lamps for your bedroom or living room. This would the perfect place to try that Radiant Orchid with a pair of glass table lamps with an apothecary base from Lamps Plus. Gone are the heavy and expensive draperies. The trend is panels, blinds, shutters and anything that will let in more natural light. Simple panels in linen, thin wool, cotton or muslin with a pared down look. Huge floor tiles, bamboo, laminate flooring in wide plank styles and various colors, vinyl planking, porcelains in many styles including a wood-look porcelain. Tip: flooring is a major purchase and there are so many choices on the market. Work with a professionalto determine which is best for your home. Forget cookie cutter designs. It's all about you and not your neighbor or a trend, for that matter. Unique and no matchy matchy"sets." Hot: shopping on ETSY, eBay, 1st Dibs, Craigs List, estate sales and consignment shops for something different. Because we have exposure to so many cultures, ethnic prints and patterns are popular in homes this year. Moroccan, Asian, South American and other influences. Lacquer trays in bold shades multi-task to serve drinks, organize odds and ends on a dresser or hold a stack of books on a coffee table. Photo: West Elm. Hot: Felt, suede and leather headboards, tufted sofas and ottomans, Lucite chairs, coffee tables and accessories. Chairs are larger and armless and love seats are becoming extinct. Nailheads in furniture, pillows. Platform beds, no box springs (we said "simple" is the trend!). For offices, which are becoming smaller as large computers are phasing out, day beds are popular and allow the room to be used for guests. Furniture with multiple uses: coffee tables that liftup and have storage or transform into a larger table for dining, occasional tables that can be used in multiples throughout the home. Vintage, one-of-a-kind pieces are popular as are reclaimed wood pieces such as coffee tables and shelving. Monograms are everywhere: linens, pillows, chairs. A way to personalize and to be unique. Palettes: blue and white, soft purple, graphic prints, plaids. Grays. Ikat prints. Tip: Keep floral prints in the bedroom and solid tones in the family room. Timeless white/black color scheme. Eco-friendly cabinets with no formaldehyde and non-toxic glues, binders and finishes. White-glass appliances are a change from the stainless (no smudge) which is still popular. Quartz countertops. These are engineered but look like granite and are sustainable and more durable, resists stains and chipping. Touchless, motion-sensing faucets that areeasier to use, cleaner, and cut down on water usage in kitchens and baths. High-efficiency showerheads and toilets, barrier free walk-in showers that do not require being stepped over, stand-alone bathtubs as centerpieces, wall mounted sinks. The holidays are over and the next big event happens tomorrow night: the return of Downton Abbey! And if you are like me, you can't wait for the new season. Check out my article in the Fort Myers-News Press today for a few tips on bringing a bit of the Downton look into your home. We pick up six months after the shocking finale that ended with the death of Matthew Crawley. And now we will find out how Lady Mary and baby George are coping. Will she be able to save Downton? What dark secrets and new romances will unfold upstairs and downstairs? We have so many questions. But let’s face it. The star of the show is the house, a manor house set in Edwardian England at the turn of the 20th century. The show revolves around the estate and it details the daily life and scandals of the family of wealthy Robert Crawley, the Earl of Grantham and his American wife, Lady Cora Grantham; their three daughters and household staff. Each week it lets us peek into life inside the manor house. It is as though we should not be there listening and watching. But we can’t turn away. The captivating writing and stunning appearances transport you to a time that marked a turning point for England and the entire world. And for the Crawley family, it is about holding on to a lifestyle that is slowly slipping away. 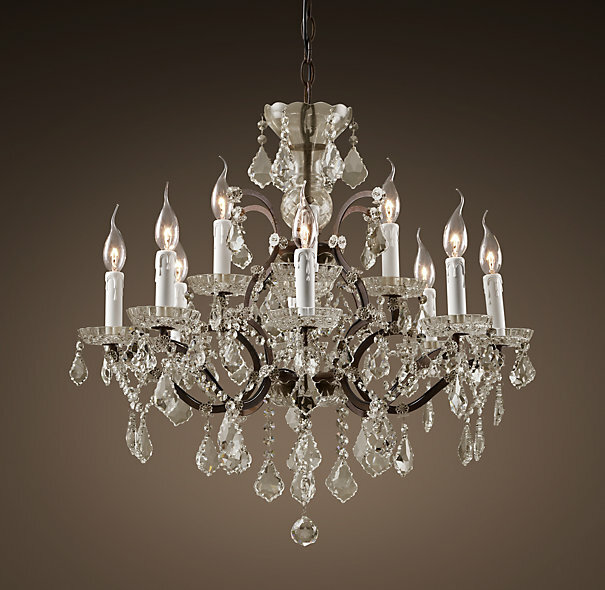 Inspired by the opulence of Victorian English chandeliers, this Rococo iron and crystal chandelier from Restoration Hardware adds sparkle to any room. Photo: Restoration Hardware. Inspired by the opulence of Victorian English chandeliers, this Rococo iron and crystal chandelier from Restoration Hardware adds sparkle to any room. Photo: Restoration Hardware. And it is the lifestyle that captivates us. Even though we don’t have a library that holds 5,500 books, some dating back to the 15th century, and a dining room table that seats 32, we still long for a tiny bit of the feeling of opulence, taste and sensibilities of that period. As a Fort Myers interior decorator, I always ask my clients how they want their home to feel when they walk in the door. Not look, but feel. So if you would like to put a little of the Downton Abbey feeling into your home, think about these tips. 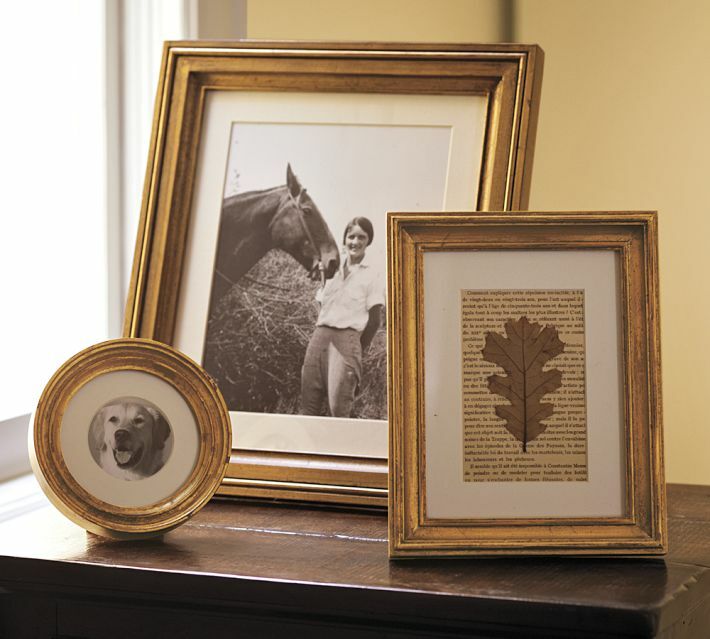 Pottery Barn gilt finish frames. Photo: Pottery Barn. • Add some gold touches. Gilded is the look and you can achieve this with metallic paint or spray paint on chairs or the legs of a table. Find a small chair (or two) that needs some work. Paint it gold and reupholster in a beautiful new fabric. • Hang family portraits. If not yours, purchase some at flea markets. Stack them on top of each other and cover entire walls. Forget all of the rules that I have previously given you for hanging artwork. Stack them! • Display crystal candlesticks. The more the better. They add sparkle and in the evening give that beautiful color that we love about this show. Purchase from consignment shops or flea markets. 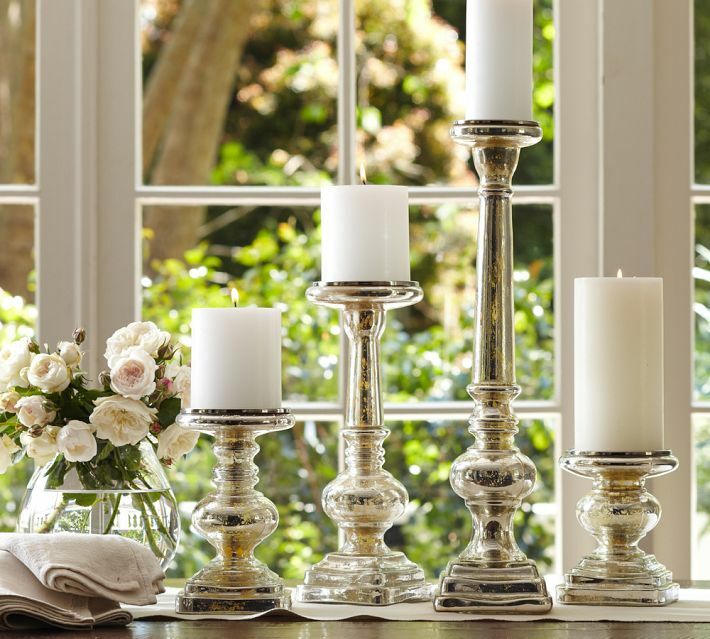 If crystal isn’t possible, try the beautiful antique mercury glass pillar and candle holders from Pottery Barn. They provide the dramatic display of silver and light that is so much a part of the Downton lighting. Mercury glass pillar candle holders from Pottery Barn. Photo: Pottery Barn. • Hang a chandelier. For sparkle and a beautiful, warm reflection off the walls like in the Downton drawing room. And sconces, especially in the bedroom and bathrooms. • Embellish. With tassels, add them to lamps or for a more subtle touch, use them to tie back thick drapes. Or just loop a really gorgeous one around a doorknob. • Create a library. It doesn’t need to be huge but a wall or part of a wall will allow you display your books and achieve that Downton look. If that doesn’t work, try Brunschwig & Fils outrageously fun, faux, library print wall covering and instantly add floor-to-ceiling built-ins packed with wonderful books. • Don’t forget the kitchen. One of my favorite Downton Abbey accessories is the wonderful standing tiered pot rack in the corner of the kitchen. Use colorful pots and of course, a few copper ones. A hammered steel cookware stand with the look is available at Williams-Sonoma. Add functional style to your kitchen with a hammered steel cookware stand from Williams-Sonoma. Photo: Williams-Sonoma. • Add a lady’s writing desk or vintage writing secretary. You may not wish to spring for the original rosewood Edwardian version, but the beautiful Bramwell writing desk from Pottery Barn works with its antique brass hardware and is an updated option. • Display china and crystal. Bring it out of storage. Display it on a sideboard, shelf or arrange decanters on a silver tray. And to dust all of this, you will need an ostrich feather duster like the sassy one on the show! • Layer everything. Drapes. Pillows. Rugs. This may be a little too heavy for Southwest Florida but layering can be done with lighter fabrics. • Add damask paper to an accent wall in a modern color. • Purchase something tufted. A sofa, ottoman or chair. This is a popular look now for any home. • Oriental carpets, whether original or copies, are classic Downton Abbey. • Add architectural details. Colorful moldings and chair rails. Paint inside doors panels a color for pop. • Mirrors, mirrors on the walls. Gilded, patinaed or whitewashed. My favorite: the manor house whitewashed mirror from Restoration Hardware. The whitewashed look is casual enough for Southwest Florida homes and is a great statement piece. Make a statement with this Manor House Whitewashed mirror from Restoration Hardware. Photo: Restoration Hardware. • Color your home in Downton Abbey tones. The beautiful rose wall covering in Sybil’s room. And the wood tones, cornflower blue walls and the white ceiling in Cora’s room. The kitchen’s grays, browns and ivory. The reds, greens, blues and browns of the library. And that red velvet sofa. The drawing room’s pastels and creams, the yummy green/aqua, pale rose and ivory. You can add touches of these colors by coming up with a palette and using splashes of color in accent pieces, fabric or on walls. • Include palms for an opulent touch. The larger the better to fill corners. Palms were the hallmark of Victorian homes. This is the easiest tip of all for Southwest Florida homes! Wrenda Goodwyn is a Southwest Florida interior decorator. Home Inspirations appears the first Saturday of each month. Visit her website at spectacularspaces.com. Call her at 949-1808 or e-mail wrenda@spectacularspaces.com. For more decorating tips, visit spectacularspaces.com/blog. Mirror, mirror on the wall: Tips for a makeover! If the mirrors in your bathroom have seen better days, it's time for a makeover and this one is very easy! And will have the most impact on the room for a few dollars. And if your bathroom itself is lookinga little outdated and tired but you are on a budget, replacing or redoing the mirror will make a huge impact in the entire room. Face it, if your mirror is huge and goes from counter to ceiling it is time to update the look. Especially if it has watermarks along the bottom and sides. Or maybe you have a medicine cabinet with a mirror that is looking worn, it is time to replace with a new one that has a more contemporary mirror. And if you have a vintage-style bathroom, think about reframing your mirror with some of the easy and inexpensive frame kits that you can do yourself. Purchase a kit from www.mirrormate.com. Select from more than 60 styles, frame any mirror, in any decor. This method is easy and affordable. Perfect for the do-it-yourselfer! Produces immediate results. This is especially good if your house is on the market and you want to make a few changes that will make the room shine for prospective buyers. A favorite is the contemporary pivotal mirror that gives a bathroom a fresh, designer look. One over each sink or just one over a smaller vanity with one sink. If you are planning to redo your bath, remember, the mirror is the focal point and you look at it every day! So, for a few dollars and some creativity you can enhance the room.